A new trend has been set by Apple with the iPhone X, and we have started getting Android smartphones with a notch design. No matter users like it or not, the companies are surely going to launch phones with a notch design. There are many examples like Asus, Huawei, Vivo, Oppo, etc. 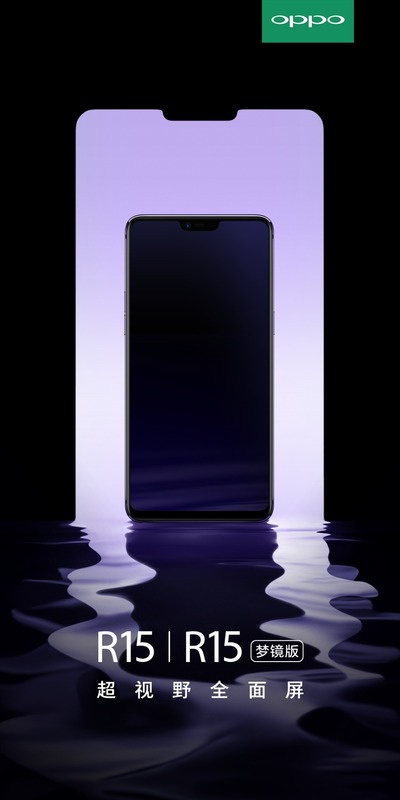 Recently, we got a teaser image from the official Oppo page on Weibo that revealed the design of upcoming Oppo R15 and R15 Plus. Both the phones have a bezel-less design and a notch on top that houses the earpiece and the front camera. Just now, we got another important detail related to the R15, and that’s about the processor that is powering the phone. The Oppo R15 is coming with a MediaTek Helio P60 processor under the hood, and if you recall, this chipset was announced at the Mobile World Congress. In fact, it is a very capable processor for mid-range smartphones due to its specifications like 12nm FF process, 8 Cores (2.0GHz 4X Cortex A73 +2.0GHz 4X Cortex A53). It is quite obvious to see up to 50% boost in the next generation of a chipset, but this time, the company claims MediaTek Helio P60 to be 70% better than the P30 regarding the performance which is impressive! This new chipset also comes with a new GPU, i.e., the Mali-G72 MP3. The 12nm process means that this chipset is going to be very power efficient. In fact, the company claims that it uses 12% less power on average use than the P23. There is also a new NeuroPilot AI technology which, as it suggests, is for some AI based features like maximizing performance and efficiency. It looks like the Oppo R15 is going to be a great mid-range smartphone with this chipset. There is no detail of other specifications yet so stay tuned for that.